Thanks to Dr. Eman Abdelzaher, Alexandria University (Egypt), for contributing this case and the discussion. To contribute a Case of the Week, follow the guidelines on our Case of the Week page. (1) Buy your books through PathologyOutlines.com! 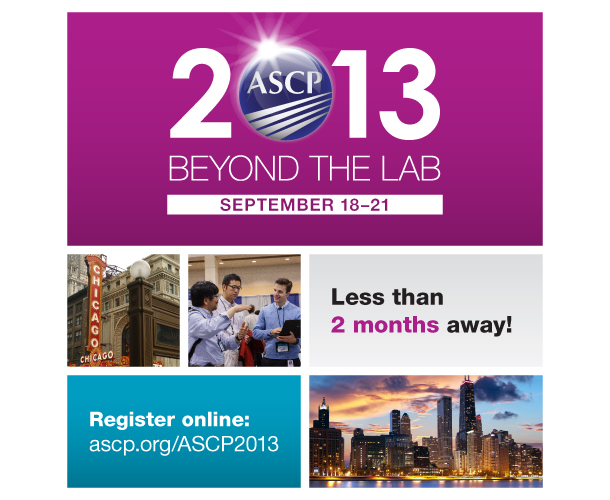 We list every recent book of interest to practicing pathologists, by specialty and by author. Click here to take a look. We also list books separately from AFIP, CAP, LWW and WHO, and update our website regularly. We are the only place where you can see all the books that have been recently published. If you buy a book, or anything else, from Amazon.com by going first to our website, Amazon pays us a small percentage from their profits (not from you), which helps support our free website. If there are books that should be listed, let us know at commentspathout@gmail.com. (2) Our Feature Page for August highlights Books & Journals and includes Pathology Network. We also have a new Mystery Case on the right side of the Home Page. (3) We posted a new article on our Management Page: Thoughts on the Proposed Medicare Fee Schedule, by Mick Raich, President, Vachette Pathology. (4) July is typically one of our slower traffic months, but July 2013 showed record traffic of 419,043 visits, for a daily average of 13,517 visits or 323,275 "hits". Our increasing traffic is likely due, in part, to our expanded reviewing of our 6600 topics. We currently have 20 chapters, 40 "stains" and 40 CD Markers under review. If you are an academic, or have an academic bent, and want to help pathologists worldwide, please take a look at our Reviewer Resources page for everything you need to know about being a reviewer and how to get started. (5) We have added new Board Review questions, courtesy of BoardVitals, which is accessible via our CME page. A 17 year old girl presented with headache. MRI showed a small enhancing choroid plexus lesion involving the occipital horn of the right lateral ventricle. 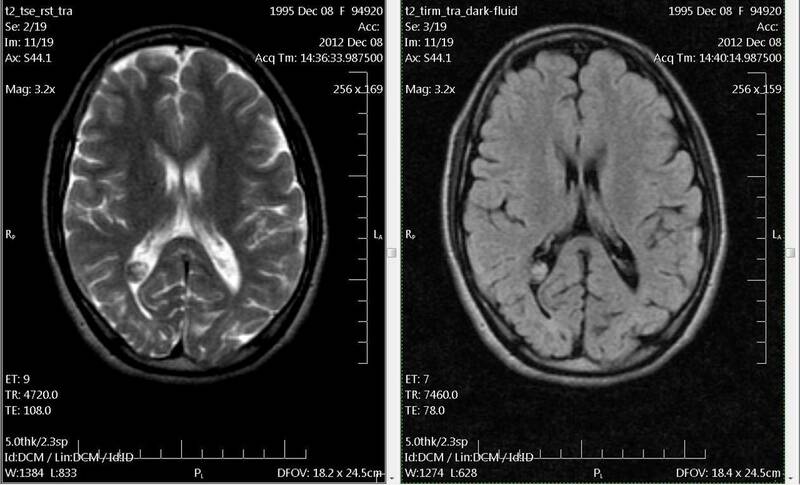 On CT scan, the lesion was densely calcified, but no mass effect was noticed. At surgery, the lesion was attached to the choroid plexus. Macroscopic examination: Soft tissue specimen (2 x 1.5 cm) is received. Cut section showed multiple granular whitish foci. The entire specimen was processed. 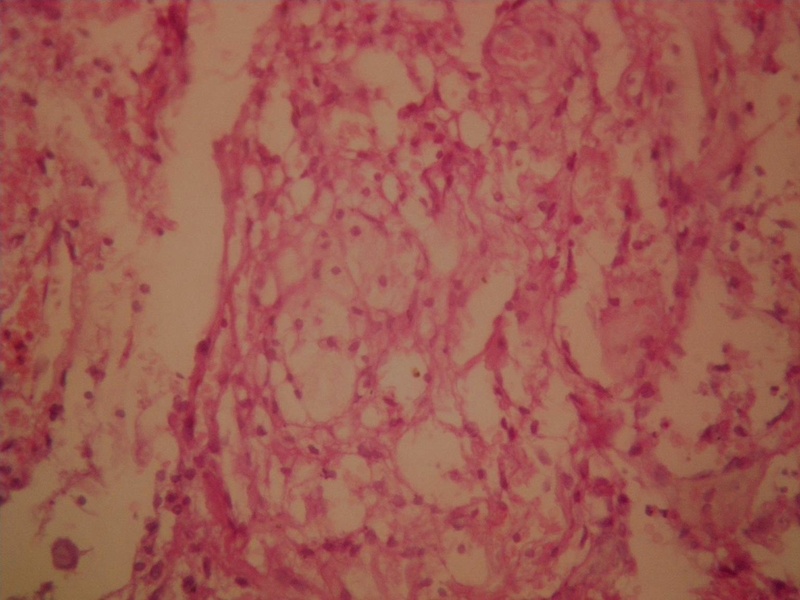 Microscopic examination revealed a xanthogranulomatous reaction. 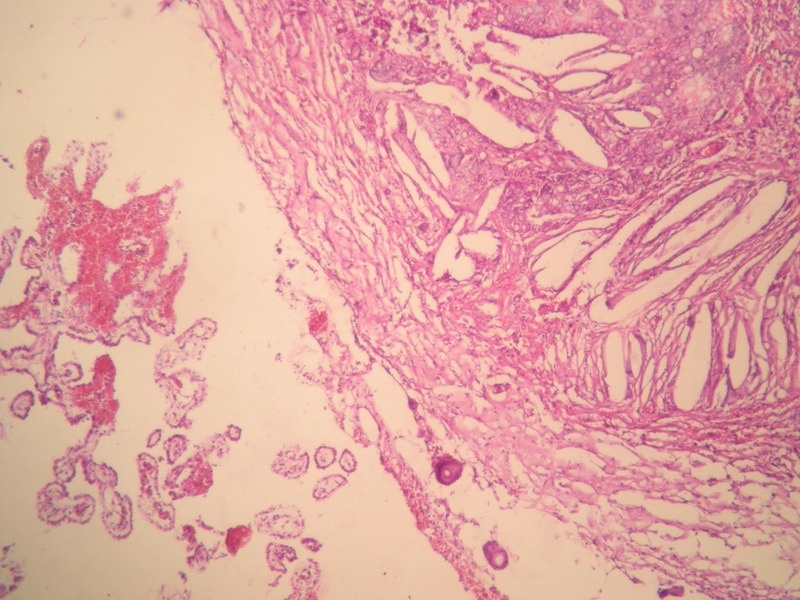 Cholesterol clefts, multinucleated foreign-body giant cells, and scattered calcospherites were seen. The background is fibrous and shows a lymphoplasmacytic inflammatory infiltrate and hemosiderin deposits. Focal degeneration and hemorrhage were seen. Focally, aggregates of xanthoma cells were noted. Choroid plexus was noted in the lesional vicinity. Psammoma bodies were also seen. Intracranial xanthogranulomas are somewhat rare, benign lesions and occur most commonly as choroid plexus xanthogranulomas. The exact etiology is uncertain.(1). The first reported case of xanthogranuloma of the choroid plexus was reported by Blummer in 1900, under the diagnosis of �Cholestomatous endothelioma�(2). 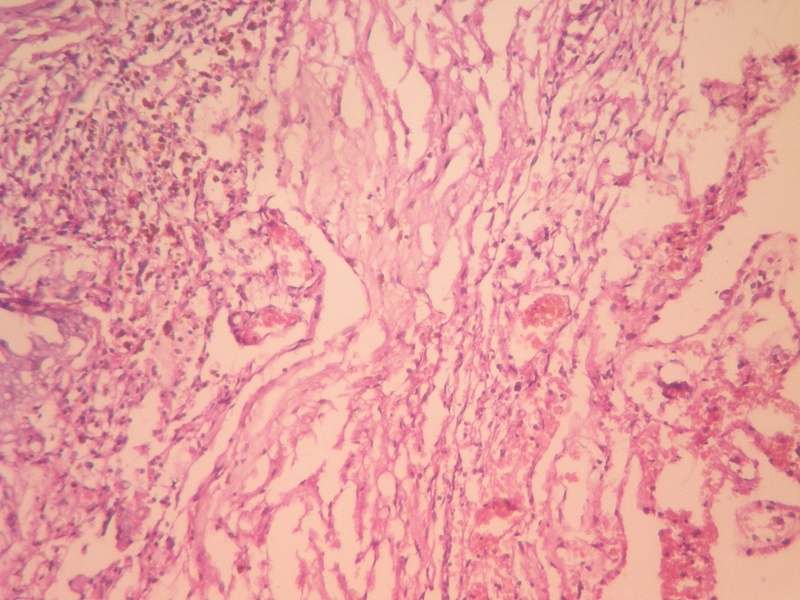 Most xanthogranulomas of the choroid plexus arise in the lateral ventricular choroid plexus. (3) They are usually asymptomatic incidental findings, found in 2-7% of postmortem examinations (2). 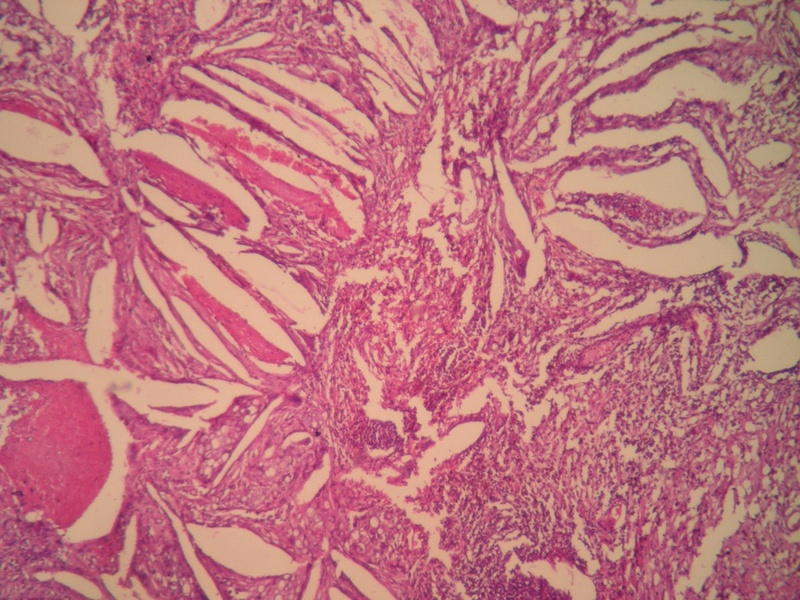 The xanthomatous reaction usually involves the stroma of the choroid plexus, and to a lesser extent, the epithelium (4). 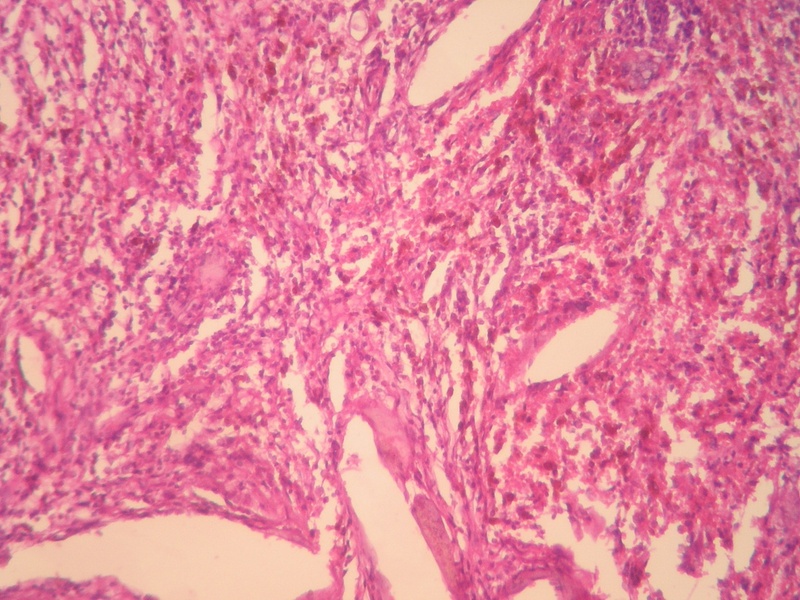 Like other xanthogranulomas, these choroid plexus xanthogranulomas are composed of xanthoma cells, cholesterol clefts, giant cells, hemosiderin, fibrosis, and occasional calcium deposits (3,4).